Psycho Solo Diver – Online Diving Blog and more!August, 2013 | Psycho Solo Diver - Online Diving Blog and more! You are currently browsing the Psycho Solo Diver – Online Diving Blog and more! weblog archives for August, 2013. Zipper? Check. Pee Valve Closed? Check. With my need to get more dry suit experience, at least experience where my dry suit actually stays dry inside, I opted for yet another exiting dive at Veteran’s Park. I was happy to see the famous Polish Diver Mirek, who dove at the South Pole in 2006. I waxed my zippers, geared up and had someone verify that my zippers were completely zipped; I also closed my pee valve. Others were waiting for dark; I had to work early the next morning, so I took off solo. I made it through the surface chop and descended in 20 feet of water. I could tell this was going to be a dry dive when I felt the dry suit squeeze and not water leaking in. I went West; visibility above the canyon was 10 feet, and once I headed down the canyon, it opened up to 15 feet. I actually enjoyed this dive, it seemed to go well, and I just took it slowly – lots of shrimp, yellow crab and I came across a big patch of squid eggs. I didn’t take my camera, I wanted to concentrate on my dry suit abilities, or at least getting better at them. I turned around at 85 feet and at 60 feet, I went North for a bit. When I got down to 1200 psi, I headed in. I waited in the surf zone for some waves to pass by before making my mad dash to shore. No waves; I was determined not to fall. Then, there’s that convenient sand step at Vets… the sand slipped from under my feet, and I fell down. I crawled a bit before getting on my feet. I saw a diving couple that has been MIA for a couple of years – Ken and Veronica. They quit drinking and started skiing and other macho activities. Ken lost 80 pounds and remarked he has a lot more money now; they both looked good. I debriefed with a couple beers before heading home to the ghetto. Comments Off on Zipper? Check. Pee Valve Closed? Check. In two weeks I leave for Poland, and I need to get amazingly proficient with double tanks really quickly; so far I have zero experience. So now, at least, I can get in another dry suit dive. I geared up and made sure to zip my zippers; it’s hard to get a visual, but I couldn’t zip them any more. I made an easy entry through the surf, put my fins on, and I was away. I noticed I wasn’t getting much ball squeeze as I descended… actually I wasn’t getting any. My dive plan was simple – go straight West to 100 feet, turn around and come back. As I descended down the canyon, I realized I wasn’t feeling “dry suit squeeze” because the pressure was being relieved by all the water that was flooding into my dry suit. Yep, flooding again – at least I’m not an astronaut on a space walk. Well, no reason to cancel the dive – I continued to 101 feet where I turned around. At 60 feet, I swam North to a formation of blocks and then went back on course. I wasn’t cold, just pissed I had flooded. I made it out and fell in the surf, just as I had before. Luckily, I fell right in front of a rescue class – they stood there and watched me crawl a bit and then get up. 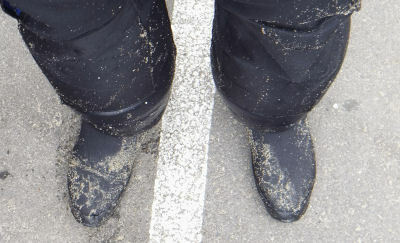 A flooded Dry Suit can hold a lot of water. Upon inspection by Chris From Detroit, it was discovered that, even though my zipper felt like it couldn’t go any farther, the zipper had another inch to go. I also later noticed the pee valve was open, and I wasn’t hooked up. OK, even though I still really hate dry suits, I have learned now to be more paranoid about the seal.